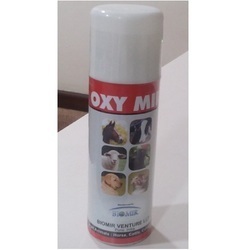 Leading Manufacturer of oxy mir and oxy - mir veterinary medicine from Pune. Horse, Cattle, Calves, Sheep, Goat, Dog & Cat. For the treatment of foot rot and skin infections. It may be used post-operatively on wounds or for traumatic damage to the skin, such as contusions, abrasions, and lacerations. After cleaning the affected area, spray from a distance of 30 cm (1foot) during 1-2 seconds. The gentian violet marker will indicate the area covered. The container is pressurized. Do not puncture or incinerate the container when empty. Shake well before each use. Kep away from eyes. Avoid container inhalation of the product. Storage: Store below 25 0c .Keep away from heat.Do not refrigerate. Poultry : 4 grams in 1 litre for 4-5 days. 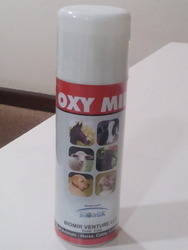 Looking for Oxy Mir ?